Description: Fabulous very private horse property on 2.63 acres with endless possibilities! Beautiful custom-built, original-owner home in a very prestigious area with wonderful views. Country kitchen & formal dining room. A beautiful 3-way fireplace divides the dining and living room. The master suite has a 3-way fireplace, a very spacious bath with large walk-in shower, jacuzzi tub and double sinks. Sunroom has lovely kiva fireplace & gorgeous views. Built-in vacuum system & lots of skylights. Metal roof. 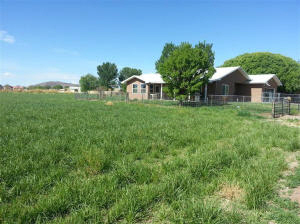 The finished/heated horse/hay barn has everything for the horse lover including 5 stalls, tack room, hay storage, bathroom & great irrigated pasture. Natural gas. Additional acreage is available. Come and bring your horses and enjoy the peace and quiet of this place that you will love to call home!